To properly track the conversions that happen on your website as a result of ads that you’re running on Facebook, you need to use a conversion tracking pixel to put on your website. 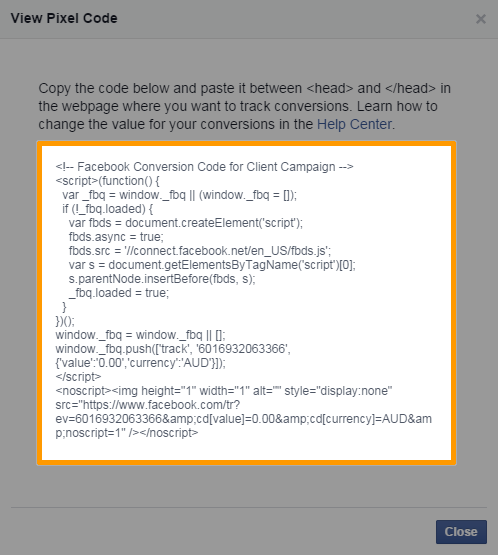 Copy and paste the entire code between the <head> and </head> tags of your webpage where you want to track conversions. For example, if you want to track successful enquiry submissions, put the conversion pixel on your Thank You page. The Facebook conversion pixel is different from the custom audience pixel. Make sure that the conversion pixel is installed in only one webpage. Make sure that only one Facebook conversion pixel is installed in your webpage. It is not a best practice to load multiple conversion events on a single page, as this will result in inefficient optimisation and tracking of these conversion events.